Recently, I was talking baseball with my father, who lives in Georgia. Our conversation turned to the recent exploits of my dad's local team, the Atlanta Braves, who had just run off an unexpected 14 straight wins in a row. The streak caught the attention of sports writers at around the 11th win, and the team received lots of additional press coverage. But I wondered at what point was the win streak truly special? If we were to look at the performance of the team over the first half of the season, would I have expected to see a streak of this magnitude? Was this streak just ordinary performance of a good baseball team, or is it a sign that the team is playing unexpectedly better? The first thought that came to mind was to merely measure the counts of the win streaks so far this season. So first we need to define how we will capture these streaks. So let's term this measure a win run, which we will define as the count of the number of games a team wins in a row once they first register a win. So for example in the list below, you can see that on 4/05/13 the Atlanta Braves started a win run that ran up to 10 games. It also made sense to break the data into two parts: the first half of the MLB baseball season (up until the All-Star break on 7/16/13) and the second half of the season (where we are seeing the surprising trends). 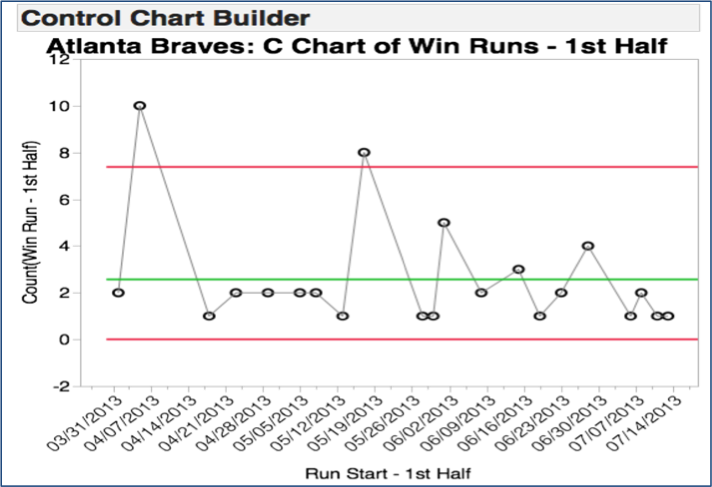 Looking at just a simple Run Chart below, we do get some visual feel for the impact of these streaks and note that the Braves had several large win runs in both the first half and second half of the season. However, we can’t really answer yet whether the recent 14-win performance was really special, especially since there is a lot of small variation on the chart (win runs of one or two) mixed in with occasional large runs (of 10, eight and then 14 win runs). Many statistical approaches are available to test the probability of getting a streak of this magnitude. However, I decided to explore whether there is another graphical way of helping to answer this question. In my experience, control charts are a great way to set expectations since they add upper and lower “control limits” to charts that let you judge when points go beyond expected variation. So if we can establish an upper control limit showing the highest expected win run level based on first half of the season performance, then one could use this limit to visually gauge how the second half performance would compare to this upper limit. So this is why control charts are often called “run charts on steroids” since they will add some additional visual information in the form of control limits for us to use to judge whether expected performance has changed. Please note that this is not a traditional use of control charts as they, like many statistical methods, come with a list of assumptions that must be met to truly get valid results. In this case, our data does not come from a true process (as we ignored losses, and there are some gaps in the time frame). And we haven’t worried about the underlying data type and distribution yet to make sure we select the right kind of control chart. Not to mention that baseball win runs are very complex, may not be interdependent and are influenced by many different and ever-changing factors (strength of schedule, player health, home vs. away performance, new acquisitions, etc.). However, in the spirit of exploratory curiosity, we will set aside the discussions of statistical correctness at this point and just try and improve on our Run Chart view with a control chart type of approach to give us a little more visual information. To do this, we will use the JMP 11 Control Chart Builder as it allows us to quickly create and change between a wide range of control charts for different types of data and situations. Given that our measure of run wins is a count, we would traditionally start by looking at an attribute C Chart type of control chart since it uses an underlying Poisson distribution that best sets limits for count type data. However, looking at the results below, it didn’t seem to fit the data well. Note the level of the upper red line (the upper control limit, or UCL) showed the highest expected count of wins in a run we would possibly expect is at 7.38 (so round this up to eight games). It seems this line is set a bit too low as any win run over eight wins would seem to indicate an unexpected happening, or what control chart users like to call “special cause.” So what is going on, and what can we do about it to set a better expectation? The problem we are seeing is that large win runs are actually what could be termed a rare event. Most teams normally experience win streaks of only one to three games at a time and would consider themselves very successful if they could win most of their series (getting at least two wins out of three when they play consecutive games against a competitor). Looking at the chart above, we can definitely see that most win runs are relatively small except for two rare events (one big run at the beginning of the season of 10 and another one midway through the first half of the season of eight. The larger number of smaller runs is keeping us from getting a good setting of the level of the upper control limit. Therefore, we need a different kind of chart to better account for these rare events. Introduced in JMP 11 is a new series of rare event charts available in the Control Chart Builder dialog. These methods build control charts very differently: Instead of plotting the counts of events (in our case win runs), they plot the time (T Charts) or count (G Charts) till an event occurs. The one we will use is the G Chart, which uses the Negative Binomial underlying distribution, which has been shown to best set control limits for these “count to event” situations. Popular in healthcare and manufacturing, they can help with rare events situations where there are very few meaningful events to measure. Again, we will use this method for another exploratory visual to improve on our initial Run Chart view. The G Chart holds a lot of promise, as the Negative Binomial Underlying distribution often produces distributions that look much like our data with many very low measures sprinkled with some sporadic larger measures. So let's try this out by now saying that we are not looking at the count of the win runs, but instead the count of the number of game wins between losses (when we initially start on a win run). We can see from the rare event G Chart below that it seems to establish a more realistic upper limit. Therefore, in the second half of the year, we could realistically expect up to an upper limit of 12.75 win runs (round up to 13 wins) for the Braves based on how well they played in the first half of the season. 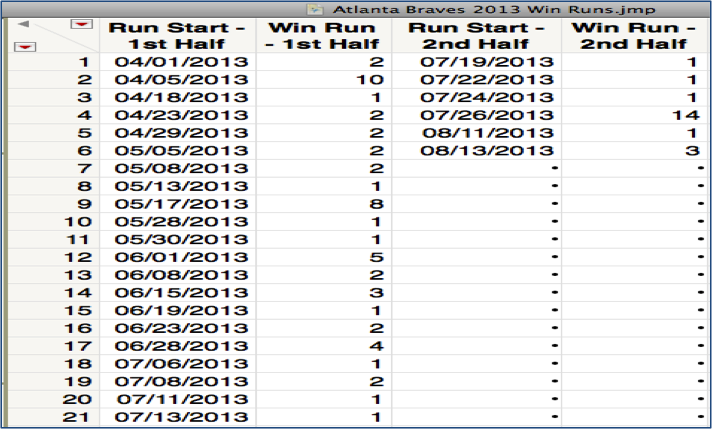 Looking at the recent 14-game win streak from the Atlanta Braves that began on July 26, it is obvious that they did do something unexpected to generate this 14-game win run above the upper limit that we established in the first half of the year. So something “special” occurred to allow this run. What can we attribute this beating of expectations to? Again talking to the experts, first and foremost my father who watches a lot of baseball and follows the Braves closely, here are some probable reasons for the unexpected win run of 14 games. The Braves have a very favorable second half schedule where they will play mostly their divisional rivals, who have all have fallen to very poor win percentages in the back half of the year (below 50% win percentage). The introductions of some new offensive players (especially at the shortstop position) have generated more hits, and some new recently brought up pitchers have helped keep opposing team scoring down. With the success of the G Chart view to look at the win streaks of the Braves, we thought it would be fun to look at the first half performance of a few other leading teams in their respective divisions in both leagues. These teams are the ones who are getting "hot" in the second half of the season. 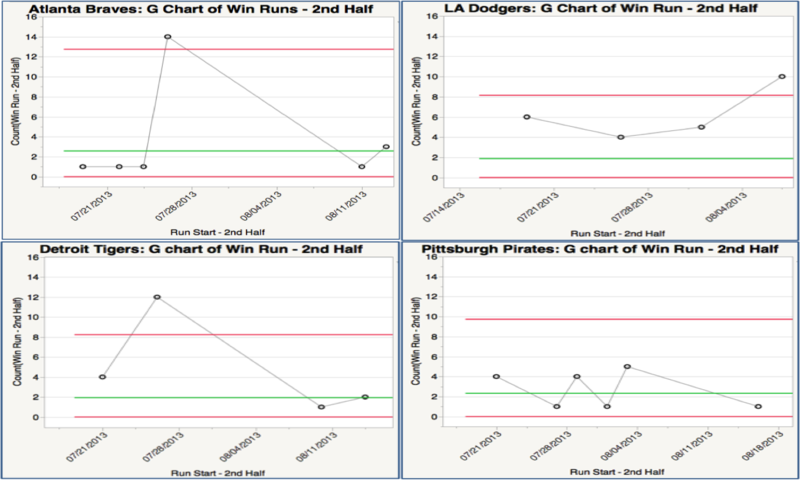 The first table below shows the expectations these leading teams generated using their first half control charts showing average and upper control limit for win runs. Then we added another table looking at second half performance to date looking specifically at whether they had win runs over first half upper control limits and how tough was it within their respective divisions (other division teams over .500 wining percentage). 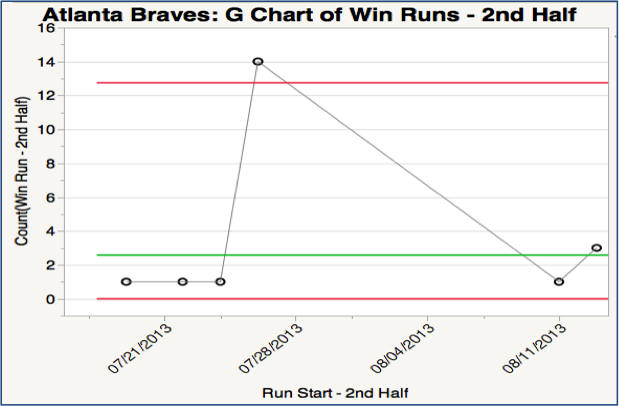 Lastly, we provided the G Chart view for the second half win runs to date for all the teams. 2nd Half – Run Over Control Limits? Other Division Teams Over .500 Win Percentage? Using our newly found rare event approach to look at win trends, we now have a way of judging when a when a run of wins is truly special. In the case of both the second half win runs for the Atlanta Braves (14 games) and the LA Dodgers (10 games), it can be argued that my father’s first explanation may be having a large effect. This year, MLB game schedules are more heavily weighted to play in-division rivals in the second half season. Therefore, it appears that both the Braves and the Dodgers are playing in easier divisions where few or none of their in-division revivals have winning percentages over a .500 winning percentage (out of five team divisions). On the other hand, the Pittsburgh Pirates and Detroit Tigers both play in more competitive divisions that contain at least two other in-division rivals that are above a .500 winning percentage. Therefore of the four, the Tigers may be the most impressive of all the recent teams on a second half win streak, as they went over their first half established upper control limit playing often-tougher teams on their schedule. Using the G Chart rare event chart in the JMP 11 Control Chart Builder, we improved on our run chart view, understood better when a win run was truly special and gained additional insight into team performance. Again, more formal statistically correct analysis could now be done at this point to definitively check the validity of the run. However, from an exploratory standpoint, we were able to quickly and easily find the story in our data. With two months left in the baseball season, you would think that more win runs of a large size are very probable. You can beat I will be looking for more unexpected win runs as we get closer to the end of the regular season and the playoff run to the World Series!